Cambodian opposition leader Kem Sokha has been unexpectedly released from prison where he was awaiting trial on charges of treason. The crackdown on the opposition sparked international condemnation and threats to withdraw aid from the country. Mr Sokha, 65, suffers from high blood pressure and diabetes. His family says his health has deteriorated during his imprisonment and that he requires shoulder surgery. 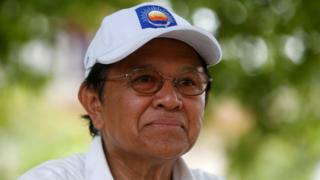 The activist turned politician had been accused of colluding with the US to conspire against the Cambodian government. If found guilty, he would have faced up to 30 years in jail. He was released late on Sunday local time but is required to remain within a small area around his home in the capital Phnom Penh and is not allowed to communicate with opposition colleagues or the media, according to his daughter, Kem Monovithya. Human Rights Watch have called on Cambodia to drop the charges against Kem Sokha without condition and reverse the dissolution of his party. "There's been no justice served here, just the temporary release of an opposition political leader that prosecutors could undo at any time," the rights group's Deputy Asia Director Phil Robertson said on Monday. "Despite the excitement connected to today's release, we're still a long way from a meaningful restoration of democracy and respect for human rights in Cambodia." Kem Sokha was the head of the Cambodia National Rescue Party, seen as the only contender to the ruling party led by strongman Hun Sen, who has been in power for more than 30 years. The party was outlawed in November 2017, allowing the ruling Cambodian People's Party (CPP) to win all seats in the July 2018 general election, making Cambodia a de facto one-party state. Western countries and human rights organisations have described his arrest as arbitrary, calling for his release. After the July election, the EU said it was considering economic sanctions while the US said it considered placing visa restrictions on government officials. Hun Sen, a former soldier in the Khmer Rouge regime who later opposed them, has been in power since 1985. He was installed by Vietnamese forces after they had ousted the genocidal regime. He has presided over a sustained period of rapid economic growth but has long been accused of using the courts and security forces to crush dissent and intimidate critics.